Given a centrally symmetric hexagon. Join the midpoints of successive sides. This creates a second hexagon. The ratio of the areas of the two hexagons is 4:3. Observe that in a centrally symmetric hexagon the opposite sides are necessarily parallel and equal in length; also the three diagonals each pass through the center of symmetry and are divided by the center in halves. Distance from FB to RN = 1/2 Distance from FB to EC. 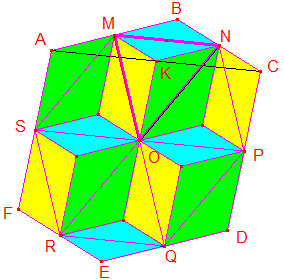 Area(MNPQRS) = 2·Area(SMNR) = 3/2·Area(ACE). From (1), (2) we have the required result: Area(ABCDEF) / Area(MNPQRS) = 4/3. However, this is not the end of the story. The story keeps unfolding. Bui Quang Tuan has improved on his previous proof. 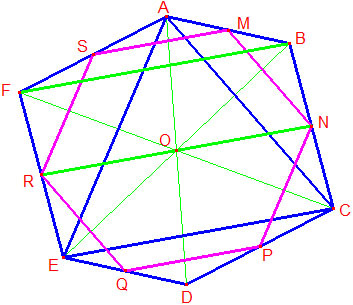 We may treat similarly triangles ONP, OPQ, OQR, ORS, OSM, as in the diagram, where all triangles of same color are congruent. Area(ABCDEF) / Area(MNPQRS) = 4/3.